Irena Polic, associate director of UCSC's Institute for Humanities Research. Hanging in the bedroom of Irena Polic’s 4-year-old twins are two long strands of colorful beads, each representing a procedure her daughter Alexa endured as she fought off the tumor that attacked her liver when the girl was just two years old. There are more than 200 beads, and in addition to marking the resilience of a tough toddler, each one could stand for a night Polic spent caring for her daughter and contemplating what it all meant. Of course this was long after she spent a year living in her basement in her native Croatia while the Serbo-Croatian war raged outside in the streets. “Living in war and having a child who faced death, these are the times you’re forced to think about your life, your place in the world, and why all this matters,” says Polic, the associate director of UCSC’s Institute for Humanities Research. These are the questions of poets, philosophers, and historians. In academia, they are the questions of the people who study the humanities, and as any of them will tell you, they are also the questions of everyday life, though many people may not realize it. People get science. Science sends us pictures of distant galaxies and stores digital photos in the cloud. Science cured Alexa’s cancer. But the humanities are a different story. Now, just shy of her 37th birthday and having faced down the adversity of three lifetimes, Polic is a coil of excited energy, so full of enthusiasm one can’t help but want to follow her. 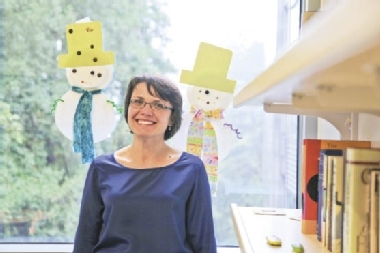 In her role at the Institute for Humanities Research, it’s Polic’s mission to help the great thinkers in the UC system connect their ideas to the lives of everyday folks—people promenading on Pacific Avenue, for example. It’s a difficult job full of promise. Academics are so bonded to their work they often take its importance as self-evident and don’t always excel at explaining its relevance. But they are doing exciting and groundbreaking work. That excitement was on display April 21 at the Museum of Art & History in downtown Santa Cruz, where the institute hosted “What Are We Doing When We Do the Humanities?,” a showcase of the best recent research in the UC system, and a bit of a pressure cooker for researchers, who were called on to demonstrate the utility of their work to a non-academic audience. Polic said the event was, in part, an effort to raise the visibility of the disciplines she holds so dear and the worldview she’s passing on to her children. Matt King is a freelance writer based in San Jose.